Partnering up with someone else to operate a business seems like a good idea when you think about it in your head. You will have someone else with you who is taking on the risk of building a business. This takes some of the weight off of you, making it easier for you to develop and operate a successful business. A win-win situation right? You might be thinking that, but you must carefully consider before bringing in a partner. A partnership can be great for your business – helping you accomplish feats you could not have possibly done by yourself. But, a partnership can also be a nightmare — creating a failing situation that has no chance of succeeding. This is why it is very important that you establish strict criteria before partnering with another individual to run a business. The person you partner with will decide the fate of your business. If you do not do the necessary background check on the individual you decide to partner with, you are running a huge risk of starting a failing business. 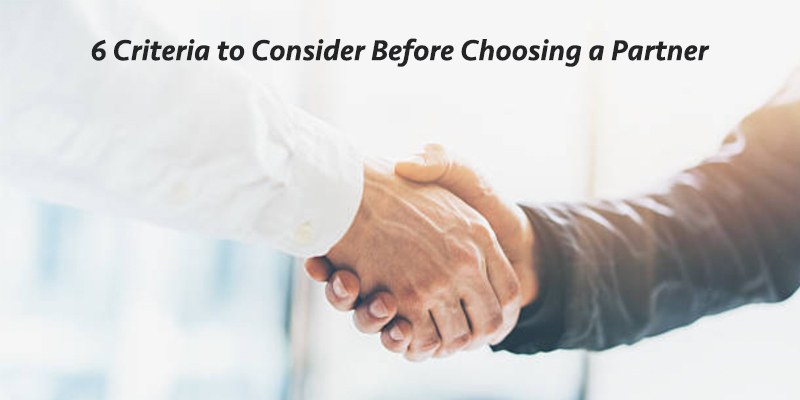 When making a decision about your potential business partner, you will want to create a list of criteria that a person needs to possess to become your business partner. This will help you make an informed decision about your potential pick, instead of choosing someone based on how well they charmed you. When it comes to making business decisions, you must do them with logical reasoning, rather than emotional feelings. Here is a list of six things to consider before choosing a partner. It has been said that your decisions should not be driven by emotions, which is still very true. But, if you have a feeling that the person you are vetting is not a good fit, then you should definitely take that into consideration. This is not a decision that is based on emotions. It is a decision driven by your cognitive processes which tell you that something the individual said does not add up. You should trust your instincts at this critical juncture. If you disregard them, you will learn that you have partnered with a con artist or someone who knows nothing about operating a business. When you choose an individual to bring on as your partner, you need to have a conversation about the qualities, knowledge, and experience they bring to the table. This will help you determine how they can pick up where you are weak and vice versa. You also want to clearly define each person’s role on paper. Establishing what each person’s responsibilities are, how much they are paid, and what is the process of exiting the business needs to discussed, written down, and agreed upon. This ensures everyone is on the same page so that no confusion occurs in the future. Ideally, you should have known the person you are going to marry for a year or two before proposing to them. The same applies when you are planning to partner with someone to develop a business. This is because a business partnership is like a marriage. You will be connected to this individual every single day unless two things occur: one of you passes away or one of you exits the business. So, you definitely do not want to partner with someone you like in the beginning but end up hating as time passes by. This will negatively affect your business due to the inability to effectively work together as a partnership. One person is doing something completely different from the other, which stifles growth because your actions are not complementary. You must develop your abilities in reading people, especially when you first get to know them. Pay careful attention to their physical and verbal cues. This will help you make better decisions about people, instead of viewing people with blinders on. Try working together with your potential partner on a couple of projects before making a final decision. If the projects do not work out, you can move on from that person without having to dissolve your partnership. This saves you a lot of headache and frustration. You want to know the person you will be partnering with thoroughly before making the partnership official. The purpose of partnering with someone is to combine your skills and knowledge with someone who has a different set of skills and knowledge. This will help your business accomplish more, instead of having a business that is held back because both partners do the same thing. When one partner is focusing on one key management function and the other concentrates on another, this helps to further the growth of your business. This makes a partnership a beautiful union. If you do not have a mutually beneficial and complementary relationship with your partner, you are better off hiring an employee. Do not be afraid if your partner is highly skilled in an area where you have no knowledge — that is the purpose of forming your partnership. Do not let your ego keep you from partnering with someone who can help you grow your business. Your emotional decision-making will cause you to be fearful of being overshadowed by a person who could be a great partner. You also want to be sure that you can have fun with the person you plan to partner with. Levity is definitely needed in the office, especially amongst partners. At the same time, there will be moments where your business is going through rough patches, and you will need a person who can weather the storm with you instead of finding the moment too difficult. The partnership may look good on paper, but you want to be sure that it works out in real life. You need to know the exact personality you are dealing with because how a person thinks and acts affects your relationship. You do not want to partner with a person who makes decisions without consulting you first. This is a person who does not value communication – placing you and your business in circumstances you did not know about until the situation is out of control. Once again, you want to partner with someone who is different from you, but in a way that complements your personality. If you are an introvert who prefers working in the background, you will want to partner with an extrovert who thrives being around people. This helps each person focus on their strengths while their partner handles their weaknesses. Now your business is accomplishing more because each partner focuses only on the areas where their strengths are at play. You also want to limit the number of partners that you bring into your business. Too many people can cause too much confusion and may actually slow your business down. You will deal with conflicts, egos, and obstacles that get in the way of smooth decision-making. This is opposite of what partnership is supposed to accomplish. You do not want to form a partnership that only deteriorates in a couple of months or a year. You need to iron out the specific details of your partnership from the very beginning before signing any official paperwork. This creates a win-win situation that leads to a long-term partnership being developed. You want to get everything out in the air so that no one is going into the partnership with any secrets or baggage. You also want to understand the business motivations of your partner. Be sure that their values align with your own values. These are the things that hold your partnership together when dealing with difficult moments and you both begin to question if the business is worth pursuing. These motivations and values are exactly the things you can remind each other of to keep working hard instead of giving up on your business. You want to create a healthy, profitable partnership that can withstand the stresses of building a business. When you create a partnership, you want to set clear expectations, have open communication, and know when it is time to walk away from the partnership if it is not producing results. You do not want to stay stuck in a situation where neither person is benefitting, but no one is speaking up about the issues. This only makes you miserable and frustrated to no end. The common reason partnerships fail is because of lack of communication and shared or complementary goals. You must know each other’s goals for both your personal lives and the business. If your goals do not align, then it means your partnership does not have a real chance of succeeding. So, when you know it is not working, cut off the partnership early before you and your business suffer as a result of it. If you are thinking about forming a partnership, you will definitely need to go over the criteria listed here before making your final decision. You want your partnership to be a long-lasting and prosperous relationship, rather than a mistake you hope to quickly forget. Focus on choosing a business partner. Leave the rest to us.